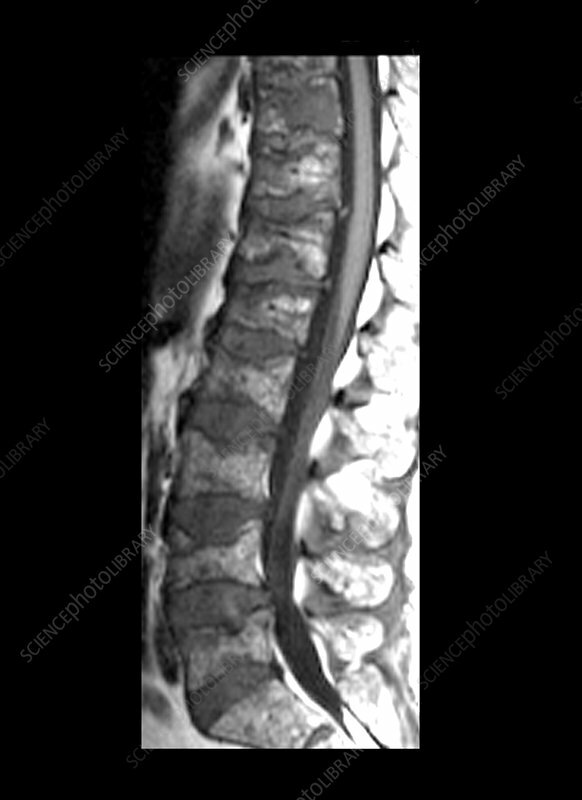 This sagittal (from the side) T1 weighted MRI image, through the lumbar-sacral spine, shows a diffusely mottled marrow signal intensity pattern which represents diffuse involvement of the bone marrow with multiple myeloma. Also noted are pathologic compression fractures of virtually all vertebral bodies. In the T10 vertebral body there is a focal mass-like lesion representing a plasmacytoma. Multiple myeloma is a malignant plasma cell dyscrasia which results in a diffuse infiltrative process replacing normal bone marrow. This results in a diffusely heterogenous marrow signal intensity pattern, but can also result in focal mass-like lesions representing plasmacytomas. The estimated frequence of this disease is 5-6 cases per 100,000 persons per year.